McFadden takes Krikke Boys Shoot Out then US Bound | Talking Speedway, Speedway news from around the world! The 2016/17 OZ season ended on a high for James McFadden after taking the 20th Krikke Boys Shoot Out at Bunbury Speedway. The Krikke Shoot Out was an awesome prize for McFadden and his Milwaukee Tools backed Monte Motorsports team. and topped off a great season . 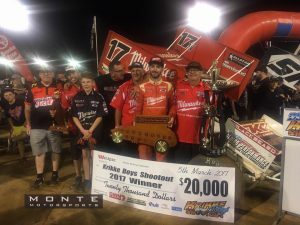 The switch of race Teams early in 2016 has been an outstanding success with numerous Feature wins which included the World Series Sprintcar Championship for the 3rd time and his massive win in the Grand Annual Classic at Warnambool’s Sungold Stadium. The Krikke Shoot Out trophy stays in Western Australian after two night of exhilarating racing. McFadden had the pole starting position with arch rival Jamie Veal sharing the front row. Night two had its fair share of crashes but that’s speedway. 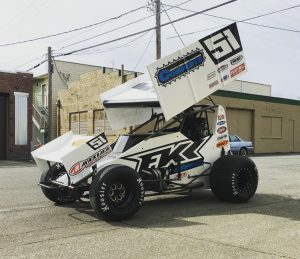 The Krikke Team had hoped that their Shane Krikke tribute car with Brooke Tattnell at the wheel might have taken the win but no one would have been too disappointed with the McFadden win .Tatnell ran a strong second after fuel problems robbed Steven Lines of an assured runner up position. Jamie Maiolo completed the Kirkke podium. Jamie Veal’s year of bad luck continued with ignition problems forcing his DNF.